SalesBrisk eliminates paper recordkeeping and unlocks greater efficiency and productivity for small and medium-sized businesses (SMEs) in Nigeria. In Nigeria, small retailers are a fixture of everyday life, providing communities with food, medicine, clothing, and many other goods. However, retailers commonly struggle to succeed due to a reliance on paper recordkeeping. Small businesses lack an efficient and affordable solution for tracking cash flow, inventory, and customer and supplier accounts. SalesBrisk is an app that empowers retailers to manage their businesses efficiently and keep accurate digital records stored in a cloud. 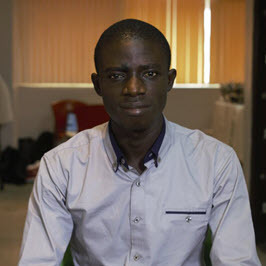 While many Nigerian SMEs don't have access to a computer or regular access to electricity, SalesBrisk operates both via the web and mobile phones, making it easy and accessible to perform accounting and manage inventory, customers, and suppliers. And because internet connectivity can be sporadic in Nigeria, SalesBrisk works offline and can sync information once the connectivity is restored. By subscribing to SalesBrisk's affordable app, small retailers can better manage their finances and operations.